An email from the Iona Institute to its mailing list today claims that damages are to be paid to “injured parties” by RTÉ. RTÉ SAID IT will not be commenting on a claim from the Iona Institute that damages are to be paid to individuals as a result of comments made by a guest on the Saturday Night Show. 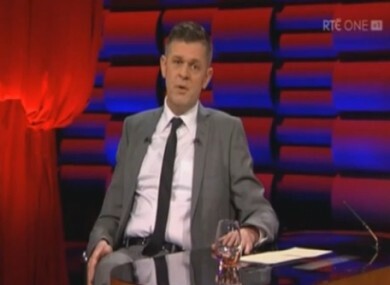 Last Saturday night, Brendan O’Connor, the host of the show, apologised for any “upset or distress” caused to journalist and broadcaster John Waters, Breda O’Brien and some members of the Iona institute, by comments made by a guest suggesting that they “are homophobic”. The guest in question was Rory O’Neill, who performs as Panti and who appeared on the show two weeks ago and spoke about his thoughts on homophobia in Ireland. The episode of the Saturday Night Show that featured the interview with O’Neill was removed from the RTÉ Player for a period of time. When it was replaced, part of O’Neill’s interview had been cut. RTÉ said that the show had been removed from the player “due to potential legal issues”. Today, an email to Iona Institute supporters said that RTÉ “has also agreed to pay damages to the injured parties”, Breda O’Brien, the Iona Institute and John Waters. The institute said: “It should be noted that no-one can ever point to a quote from The Iona Institute that can be [sic] any stretch be called genuinely abusive or ‘homophobic’”. The Iona Institute said it receives “abusive and even threatening phone calls and emails from those opposed to our point of view”. When asked about the claim that damages were paid over the guest’s comments on the Saturday Night Show, an RTÉ television spokesperson said that RTÉ would not be commenting on the Iona Institute email. Email “"No comment" from RTÉ on whether damages were paid over Saturday Night Show”. Feedback on “"No comment" from RTÉ on whether damages were paid over Saturday Night Show”.